At the 2015 event, the cannabis community emerged as strong supporters. These groups, longtime allies in providing care for people living with HIV/AIDS, have become an increasingly important voice in the Bay Area and beyond as stigma against medical cannabis fades. Just as with AIDS Walk New York, the event saw an upswing in fundraising, allowing the program of grants to smaller HIV/AIDS organizations to remain strong. On World AIDS Day, December 1, 2015, those grants were presented to more than 30 local HIV/AIDS organizations at the National AIDS Memorial Grove – part of the $2.29 million total raised. Heading into its third decade, still more exciting developments are underway for the future of AIDS Walk San Francisco. 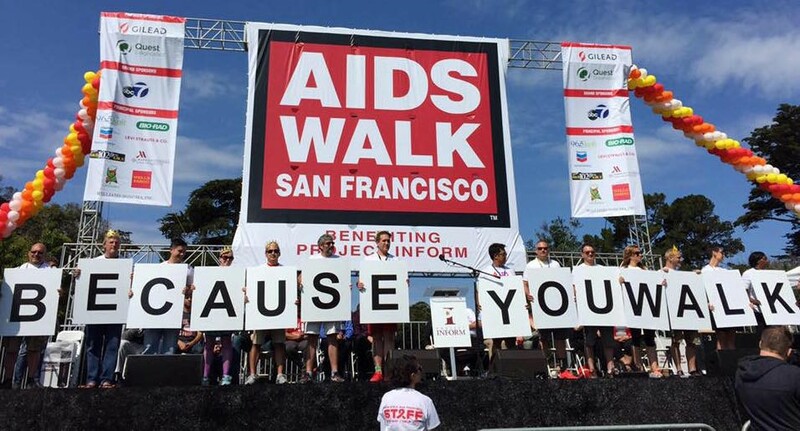 The event is now governed by the AIDS Walk San Francisco Foundation. The Foundation’s Board oversees the event’s organizing, is responsible for the funding of the campaign, and determines how its net proceeds are distributed. This year, AIDS Walk San Francisco will continue to evolve to meet the changing face of the epidemic, in part, by providing funds to a groundbreaking pilot project on HIV and Aging at San Francisco General Hospital’s Ward 86. Other primary beneficiaries will be Project Inform, leading the way in advocacy for greater access to healthcare and a cure for HIV, as well as Project Open Hand, providing nutritious meals to those living with HIV and AIDS who are in need.